All transactions are safe and secure with a reliable history in online purchasing behind each of our associates. Buy the Boondock Saints Guns t-shirt to own Boondock Saints clothing and merchandise. 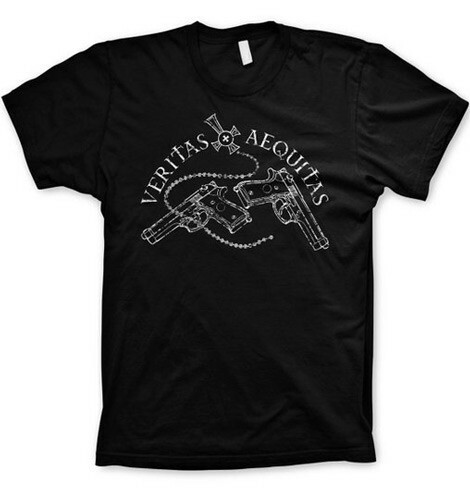 This rosary guns tee is a stylish tribute to the Saints, Connor and Murphy. Not necessarily church attire, the design on the front includes an image of the brothers' guns. Wear it under a Veritas hoodie as you recite the prayer from the movie. Support the two brothers who are always ready to unleash their swift style of vigilante justice on Boston's evildoers. Browse other apparel sizes, colors and styles. In addition to Boondock Saints sweatshirt hoodies, these tees look great with trench coats. In addition to the Boondock Saints Guns tee above, browse the Boondock Saints Clothing Gallery for more apparel like men's and women's clothes, kids shirts or hoodies.